Thanks to the App Store, your iPhone or iPod touch can be used for everything from finding a great restaurant to straightening out your paintings to replacing that Nintendo DS that's been collecting dust. Now, thanks to Rogue Amoeba, your i-device can also double as a remote speaker for your Mac or Windows PC. On Friday, Rogue Amoeba announced Airfoil Speakers Touch, an iPhone OS app that works in conjunction with the company's Eddy award-winning Airfoil, which lets you share audio over your home network (see our Airfoil 3.1 review for an overview). The companion Airfoil Speakers program allows you to turn any computer (Mac, Windows, or Linux) into a remote speaker for iTunes or virtually any other audio you can play, including Real Player, Pandora, and Last.fm. 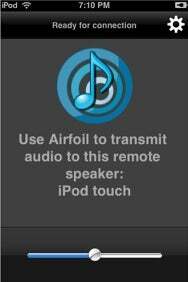 It even sends audio to Apple’s AirPort Express or Apple TV and now, with Airfoil Speakers Touch, the iPhone and iPod touch can rock out to anything that Airfoil will stream. Airfoil Speakers Touch allows you to apply a unique name to your i-device, require a password before a computer can stream audio to it, and enable an audio-level meter for some eye candy while streaming. Airfoil Speakers Touch (iTunes link) is free and requires iPhone software 2.1 or higher, as well as the $25 Airfoil for either Mac OS X or Windows.